A trek to give a full experience of this visually extraordinary and geographically isolated area, hugely rich in flora, wildlife and folklore, yet almost never visited by tourists or scientists. Lapchi Kang is a small Himalayan range lying like a twisted backbone jammed between the road to Tibet and the huge himalayan valley of Rowaling Himal. It is restricted and tucked away enough to be ignored by the tourists and yet not high enough to entice mountaineers. Somewhere in this isolated wilderness, Milarepa-an ancient Tibetan magician, went into retreat, lived in a cave, ate stinging nettles and slowly turned green! The maze of twisted hills, rock spires and sheer cliffs that make the landscape from Ama Bamare Himal to Lapchi Karhka gives the snow leopard a perfect habitat for survival. This trek follows the Tama Khosi river from Jagat to Lamanabagar where we turn off the main trail and head up through dense bamboo and cloud forest to an isolated pocket of Lapchi Kang under the unclimbed rock spire of Ama Bamare and the awesome rock face of Kookur Raja Darra (King Dog Ridge ). This Lapchi Kang Trek is unique! Lapchi trekking trail located in Rolwaling region along the border of Nepal and Tibet. Lapchi trek is an opportunity to explore the least visited isolated and exciting secreted corners of Nepal. Lapchi is famous pilgrimage of Buddhist where the famous Tibetan Yogi Milarepa’s lived in Milarepa cave for long time and died in lapchi region. Milarepa performed many miracles in Lhapchi and left behind sacred marks such as his footprints. 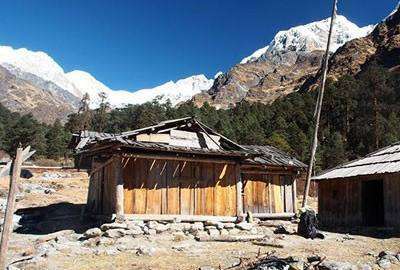 Lapchi trekking protected by the Gaurishankar conservation area require GCA special permit and TIMS for trekking in Lapchi kang. Milarepa is not only Buddhist yogi but also a poet, singer an ancient Tibetan magician also. Lapchi trek and lapchi region is the sacred destination in the Himalayas after Kailash and Tsari. According to Tibetan Buddhist and Hindus ancient literature, there are three holy Mountains in the Jambudvipa that are 1. Mount Kailash, 2. Mount Labchi Kang and 3. Mount Tsari. These are the core power places or the paramount spiritual mountains not only of Buddhist, but also for Hindus. Holy Lapchi Mountain situated in the eastern part of Nepal at a height of about 4,850 meters. Lapchi trek from Nepal side is cheap and best because it is not necessary to arrange Tibet visa and permit to explore holy Lapchi and mount lapchi Kang once in life time. Best time to trekking in Lapchi from March to October. Lapchi known as the Milarepa’s Hermitage, there are verities of cave hermitages in Lapchi. We organize labchi trekking from Lamabaagar on camping basic following Tama Koshi river passing throw dense bamboo and cloud forest to a remote areas of Lapchi Kang under the unclimbed rock spire of Ama Bamare and the awesome rock face of Cookur. Local bus / jeep transportation to/from Lamabager from/to Kathmandu. Down jacket (optional), Sleeping bag (optional), duffel bag, and medical kit etc. Guided sightseeing and meals in Kathmandu. All bar bills, beverages and tips and gratuities.